Earlier Aircel shocked Apple users with huge price tag of iPhone 4S. The 16GB version is available at Rs. 44500, the 32GB is available for Rs. 50900 and the 64GB version is available for Rs. 57500. Not only the price, the tariff plans announced by Aircel is another shock for the users. By paying Rs. 950, users will get 3000 local + STD minutes, 350 SMS messages, 650MB of 3G data and 1GB of Wi-Fi data with iPhone 4S 16GB which is not good according to its price. 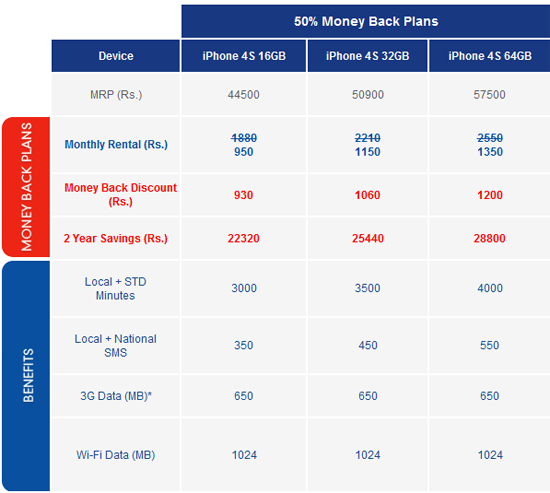 Unlike iPhone 4 launch by Aircel when they introduced 100% money back offer, this time you can only avail 50% money back offer. With this huge price of iPhone 4S and tariff plan, lets see who’s going to purchase it in India. From here, We will gather Aircel iphone 4S plans and features on here. And, Great chart with good explanation about plans on here. I’m not providing iPhone 4S. I have listed the price and tariff plans of Aircel. You can check the screenshot in the image for the price of iPhone 4S.